The Bendigo Spirit sprung into action with a win on the road against a highly-fancied Melbourne Boomers outfit in round one of the WNBL on Saturday (October 20). Point guard Nat Hurst (12 points, 3 assists) led the Spirit to a 82-72 win against the Boomers, who were playing at home last Friday evening. Hurst was supported by Marena Whittle (21 points, 4 steals), Nadeem Payne (16 points, 5 rebounds) and American import Rebecca Tobin (15 points, 9 rebounds, 5 steals). 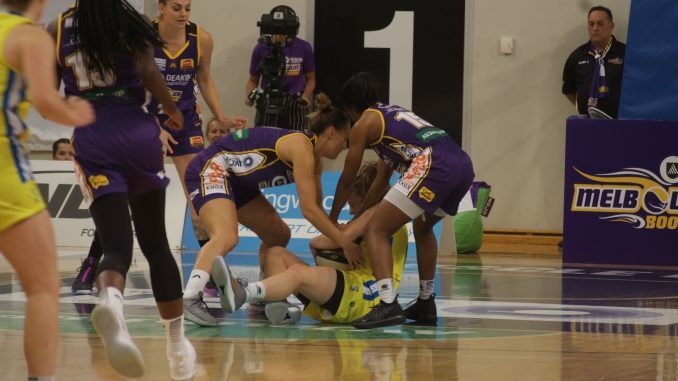 The Boomers’ much-vaunted line up, which includes four Opals players, was run down by a Spirits outfit that was hustling and able to score when it counted. Point guard Lindsay Allen (18 pts, 5 asst) and Steph Talbot (20pts) top-scored for a Boomers team that had only just come together. Newly re-signed coach Guy Molloy was calm and optimistic after the loss. “We’ve got a very talented team,” he said. “We’ve got some great players, you know [but] frankly we just looked like a team that had only four training sessions together. Spirit coach Simon Pritchard was pleased with his side’s performance. Pritchard singled out the effort of Rebecca Tobin in what was her first WNBL game. The Spirit’s best player, Marena Whittle, was just as satisfied with her own performance. Melbourne has a chance to bounce back this Friday night when they host the University of Canberra Capitals at Geelong Arena, while Bendigo will have home court advantage against the Dandenong Rangers on Saturday at 7pm. Cameron is a journalism student at Macleay Melbourne Campus, whilst working as Personal Trainer.